This is Part 2 of my own recap of the 2014 SHOT Show. 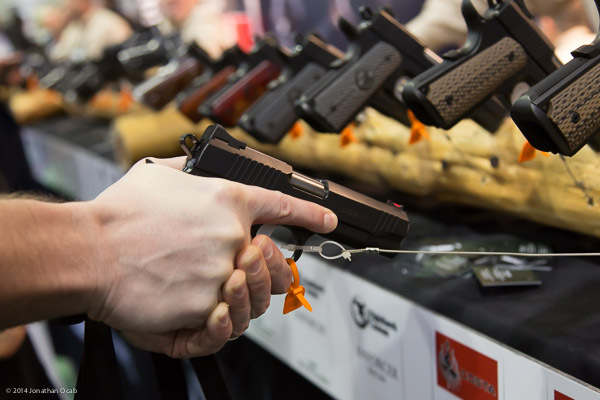 If you haven’t read Part 1 of my SHOT Show Recap, be sure to check it out. But my recap isn’t necessarily written in a specific order, so feel free to read in the order of your liking. While I make the effort to visit the big names like Remington Arms, Sig Sauer, and Glock, I definitely wanted to check out ALG Defense. 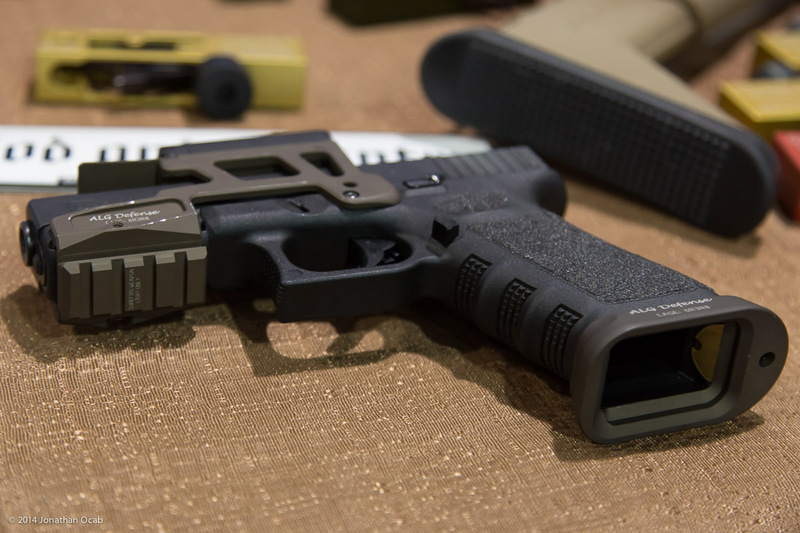 For those unfamiliar with ALG Defense, the company is actually a sister company of Geissele Automatics, and was founded by the wife of William Geissele with a focus on selling tuned triggers at a lower cost price point. ALG triggers are basically an improvement over the stock trigger in a generic lower parts kit, but at a third or quarter of the cost of a Geissele Automatics trigger. 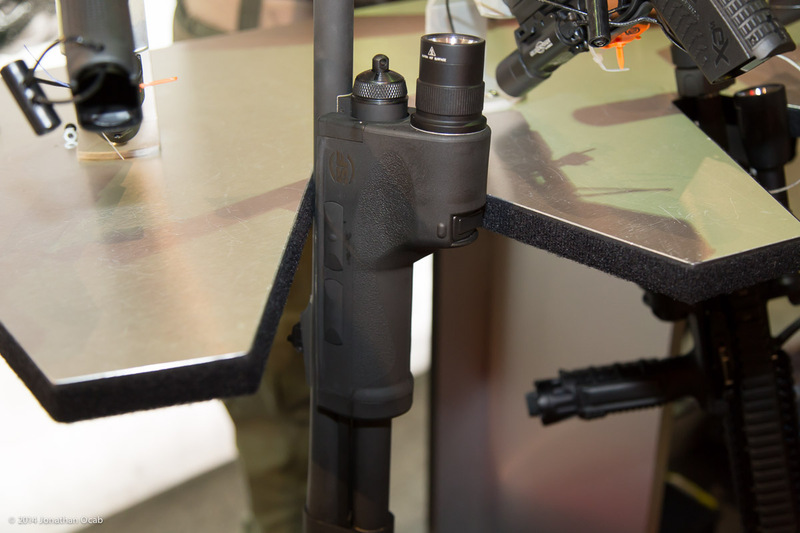 But the reason I personally wanted to visit ALG Defense’s booth was because of the ALG Flared Magwell for the Glock 17. I had seen the ALG Defense Flared Magwell at the 2013 SHOT Show, but none of the representatives at the time could give me any information on it. If I remember correctly, it didn’t even have any markings on it. It was just installed on a Glock that was just sitting on the table and everyone was ignoring it. I forgot all about it until a month ago when I saw photos of it show up on a couple gun blogs and then on the ALG Defense Facebook page. 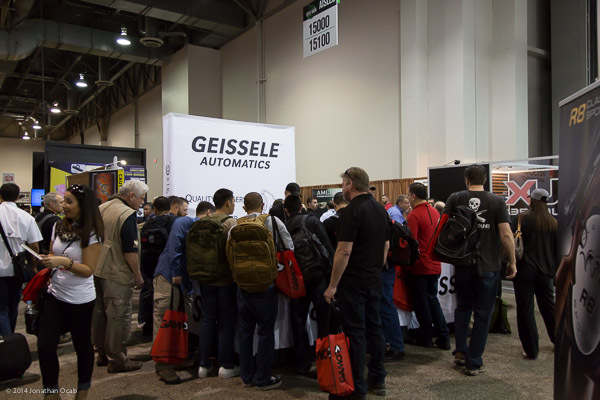 So I went over to the Geissele / ALG booth and discovered they were actually selling some units at the show and I ended up buying two, one in each of the color offerings currently available, black and sand. I have not had any time to install one on my Glock 17, but rest assured, I will be posting a truly independent review (in that I paid for these out of my own pocket) of the ALG Defense Flared Magwell in the very near future. I have dry fired an ALG Defense trigger, and I will say that it’s actually far better than a stock trigger and is a legitimate lower budget option for an AR owner that needs a better trigger and can’t afford to drop the $200 or so on a Geissele Automatics trigger. While I was walking through the Sands exhibition halls I came across the Nighthawk Custom booth. I wasn’t exactly seeking them out, but I am aware of their company, primarily because of their collaborations with Chris Costa. Nighthawk focuses primarily on custom 1911 pistols, and they recently released the Costa Recon in 9mm. The detail, fit and finish on the Costa Recon is impressive and on par with what you expect out of a custom 1911. One of the non-standard characteristics of the Costa Recon is that it uses a Jardine rear sight. This sight is specific to Costa’s specifications for this pistol because it is tough and rugged enough to handle one handed malfunction clearing e.g. via a boot, table top edge, etc. The Nighthawk Custom Costa Recon is a quality custom built 1911, but it also comes with the the associated cost in the high $3000 range depending on options. 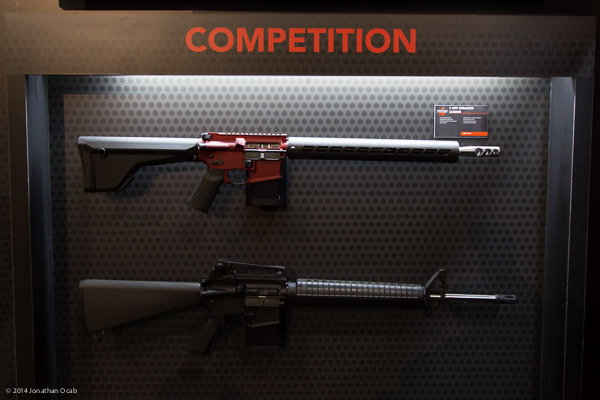 While I am a competitive Service Rifle shooter and love the AR platform, I usually don’t pay too much attention to AR-15 related items at the SHOT Show. But I did take notice of a couple of items/trends. LWRC International is continuing to push their SIX8 receiver sets / rifles, which are proprietary 6.8 SPC AR style lower and upper receivers that will not work with other 6.8 SPC lowers or uppers, respectively, from other manufacturers. The reason being is that the receivers were actually built around a new magazine designed in collaboration with Magpul. LWRCI wanted to continue to push the 6.8SPC AR platform, but with more reliable magazines. The SIX8 was actually out at the 2013 SHOT Show, but it seems like LWRCI is heavily invested in the 6.8SPC as part of their product line offerings. I find the SIX8 interesting because it seems like LWRCI is angling for a market that some would argue is dead. Perhaps the SIX8 is what will bring 6.8SPC back to life. 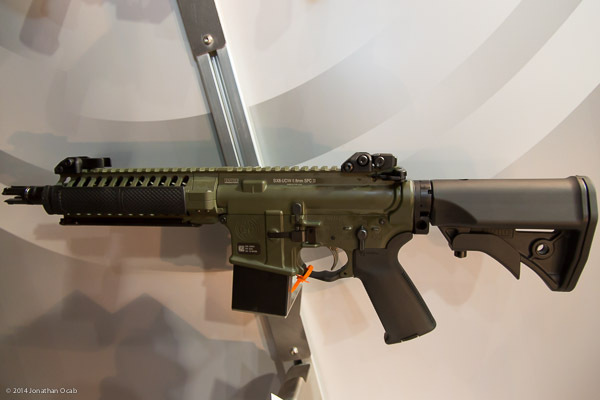 Bushmaster was showcasing a new competition 3-gun AR-15 rifle, the XM-15 3-Gun Enhanced Carbine. As you can see, it’s not your standard mass production AR-15 variant. This is a truly custom job. Could a person just put together a clone of this rifle from parts? Sure, but this is meant for people who want to get started shooting competition 3-Gun, yet can be overwhelmed by all the options out there as far as parts and configuration. It’s hard enough for me to explain to people how to build a National Match Service Rifle from parts. I can’t imagine what it’s like for 3-Gun. I think out-of-the-box competition guns are good for the shooting sports because it helps promote participation by simplifying startup costs (time and effort). Not to mention that Bushmaster actually designed and developed the configuration of the XM-15 3-Gun Enhanced Carbine by issuing it to the Bushmaster Shooting Team members to use. So you know the rifle configuration has merit and wasn’t just thrown together haphazardly by some marketing team. There really wasn’t anything at the Surefire booth that caught my eye and sadly, it seems like a quiet SHOT Show for them. Granted, once you’ve created a product line as extensive and diverse as theirs, it’s a bit hard to create a new illumination tool. That said, the only item by Surefire of interest to me is the new DSF-870 shotgun forend weapon light for the Remington 870. The DSF series is the successor to the 618 series. I actually bought the older 618FA series with the incandescent head/bulb back in 2003. Sometime a few years ago Surefire released an LED version, and I was able to convert my 618FA to LED. But at roughly 200 lumens with single power, it pales in comparison to the DSF-870. The first thing I noticed about the DSF-870 is the ergonomics. It feels a lot better in the palm of the reaction hand when gripping the forend. There are also two individual buttons on both sides (ambidextrous) that handle momentary on and constant on. It also has a programmable switch to allow you configure the light output as well as a safety switch to disable the light. Not to mention the DSF has 200 and 600 lumen modes. The DSF-870 pretty much dwarfs my LED 618 series weaponlight. If I get some spare cash, I’d like to update the weaponlight on my 870, but it’s definitely not a priority right now, and is more of a luxury. I made sure to hit up the Benchmade booth because I wanted to see the new 477 Emissary. I own the original 470 Emissary with the silver/grey handles and I love the knife. It’s a small, slim knife with a 2.9″ S30V blade and an Axis-Assist locking mechanism that I carry daily because it’s fitting for dress/suit pants. My only complaint with the 470 is that it’s not a working knife. You don’t want to grip it too tightly and work with it for any extended period of time simply because it’s too small, even for my diminutive hands. The new 477 Emissary is a larger version of the 470. The 477 has a 3.5″ blade and a 4.55″ closed length, whereas the 470 has a 2.9″ blade and a 3.90″ closed length. The extra length on the handle (and slight increase in handle thickness) make this knife far more comfortable without giving up too much in the form factor department. The impressive part of the 477 is that the price difference between it and the 470 is only $20 more based on MSRP. That sounds fair to me. I’m definitely going to have to pick one up sometime. Although, I voiced my opinion to the Benchmade representative who kindly held the 477 Emissary for the previous photo that Benchmade needs to make an Axis-Assist version of the 810 Contego. I hope he relays that to their development department. Note that while I was fawning over the 477 Emissary, I was waiting for my Benchmade 910 Stryker (long since discontinued) to get sharpened. 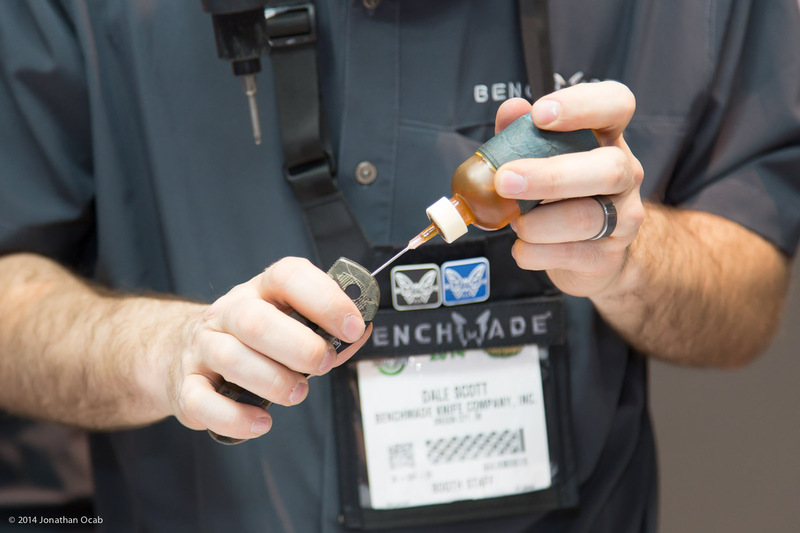 Benchmade actually brought in tools and parts to service Benchmade knives at the show, free of charge. 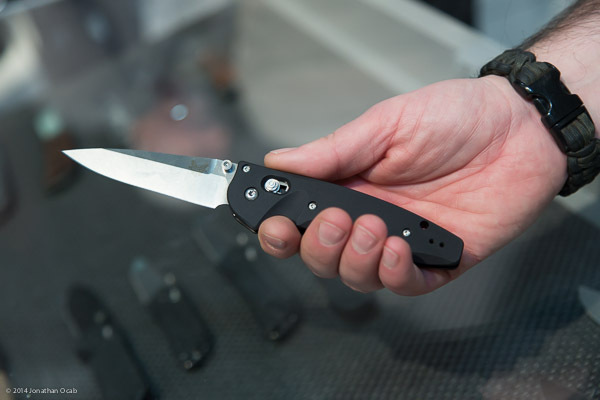 While I was remarking to another Benchmade representative about how it was a nice gesture by them to offer this at SHOT Show, he mentioned that they were actually thinking about doing away with charging for return shipping for the LifeSharp service. 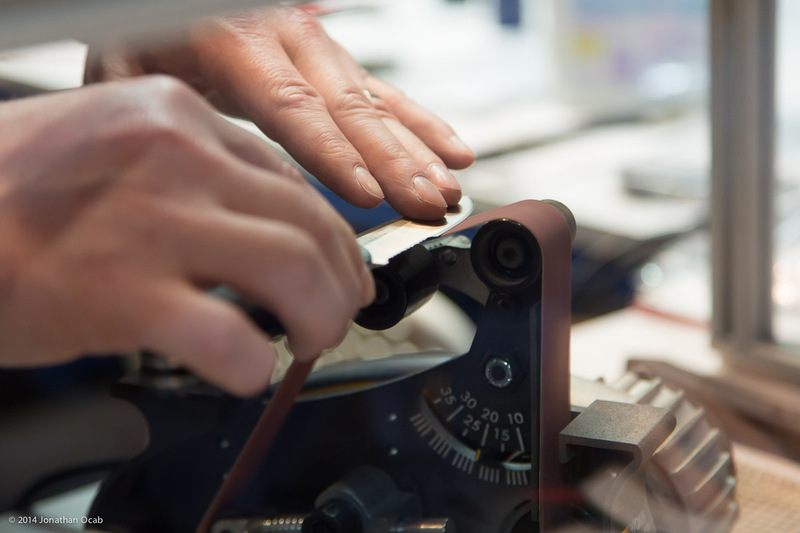 For those unaware, Benchmade offers LifeSharp for all of their knives, which is sharpening and servicing (e.g. replace bushings, screws, etc) of Benchmade knives free of charge, but with a $5 fee to cover return shipping of a knife ($2.50 for each additional). $5 is more than fair as far as I’m concerned, but it goes to show how much Benchmade values it’s customers if they’re thinking about discontinuing even charging $5 return shipping for LifeSharp service. 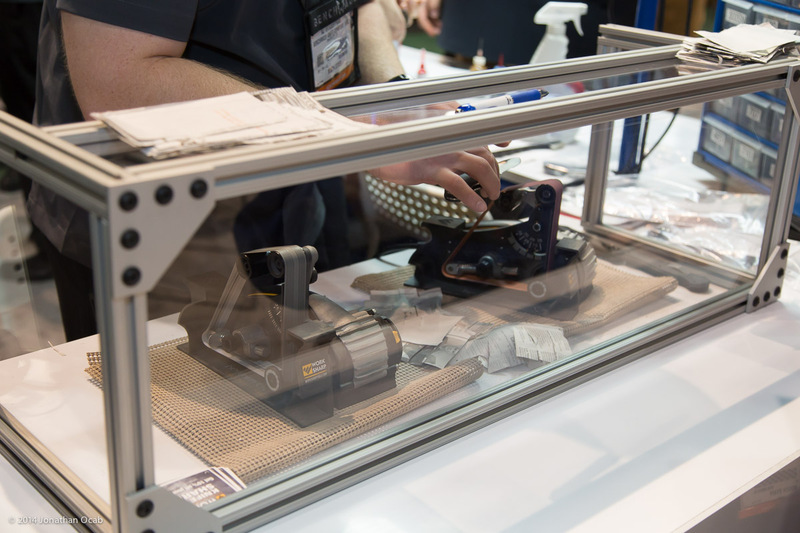 If you find this my recap of the 2014 SHOT Show interesting, note that I will be posting a third part shortly. Please note that as I indicated in Part 1 of my 2014 SHOT Show recap, I’m taking the opportunity to give a way a Hornady hat signed by Jessie Duff, current shooter for Taurus, Hornady, and Leupold, and recently named USPSA Grand Master. To win this hat you must do two things prior to 0900 PST on February 3, 2014. *AND* secondly, respond directly in the post comments below (or on any of the 2014 SHOT Show Recap parts) with your twitter handle/nickname. When you make a post comment, use a legitimate email since that’s how I will contact the winner (your email address will not be visible to the public). One tweet from a twitter account with a valid URL to the review article and a mention for @ocabj. Multiple tweets from the same twitter account will only count as one entry. Prize will only be shipped to a US address. Non-US winners must be able to retrieve the prize from a US address to be eligible to win. Anyone using multiple email and/or twitter accounts to enter multiple times will be disqualified. Randomly selected winner will be contacted via Twitter (if tweet entry) or email (if comment entry) when the winner is chosen. Winner will have five (5) 24-hour periods to respond. If no response received, a new winner will be randomly selected. Prize (Hornady hat) will be sent via USPS Postal Service. Family and friends of Jonathan Ocab are not eligible to win. You may tweet or comment on the review, but your tweet and/or blog comment will not be entered into the giveaway drawing. Sorry, but I want to keep this fair (and official). Also, anyone affiliated with ocabj.net or Jonathan Ocab Photography are ineligible for this contest. This giveaway / contest is in no way affiliated with Jessie Duff, Hornady, Leupold, Taurus or any other company, person, or entity. This is an independent giveaway being conducted by myself (Jonathan Ocab). This contest ends (winner chosen) on 02/03/2014 at 0900 PST. Again, stay tuned for Part 3 of my 2014 SHOT Show recap.